This is a bittersweet end to this run of Valiant's 'Faith.' Jody Houser has made it one of the best comics being published today. It's no surprise that it earned an Eisner nomination this year. While this arc, 'The Faithless,' ends with a whimper and not a bang, the entire run as a whole has been a triumph. Faith Herbert aka Zephyr has become the face of Valiant's superhero comics with an optimism, a confidence, and self-aware humor that makes her as relatable as she is incredible. A pop culture nerd like most of us, Faith find great joy in being a hero and helping people. She has the type of traditional enthusiasm for what she's able to do like Superman or Spider-Man has had. She keeps an alter-ego working for a website, slowly builds friendships and frets about stuff we all do - work, love, guilt. It's what makes Faith one of the best-developed characters in all of comics. I point this out because it's Faith that keeps the reader glued to the page even when very little happens and the ending is kind of weak like in an issue like this. Faith is held hostage by the dysfunctional band of villains who have dubbed themselves 'The Faithless.' They finally have her in their clutches and plan to kill her if they can figure out a way to do it without getting into another huge argument. Faith outsmarts them as they each take turns watching her. She appeals to Murder Mouse aka Jeff to find out what motivates his life of crime. Faith has always exhibited a genuine concern for her fellow man so when she tries to manipulate her captors it comes from a genuine place not just to make them look silly. There was a sense of actual menace coming from Faith's former celebrity crush in the Faithless' mastermind(?) Chris Chriswell. It seemed that Faith was in actual danger but that thought quickly dissipates when these criminals descend into the picture of incompetence. It's funny and entertaining in seeing them fumble this grand caper but the threat of real danger is gone. Throughout, Faith remains defiant but compassionate for people like Jeff who could do better for himself. If you're a fan of the series this issue won't change your opinion of how great it is but this is definitely not for new readers. Nonetheless, at its best 'Faith' captures the spirit of inspiring comic book heroes of the past while being fresh and relatable in the present. She's funny, brave, and at times very meta. The series has featured some amazing artists like Francis Portela, Joe Eisma, Margurite Sauvage, and Andrew Dalhouse who deliver consistently clean and expressive action. Eisma and Dalhouse are on issue twelve and they never falter to make a vibrant and joyful adventure even when the characters are trapped in a house mostly talking. 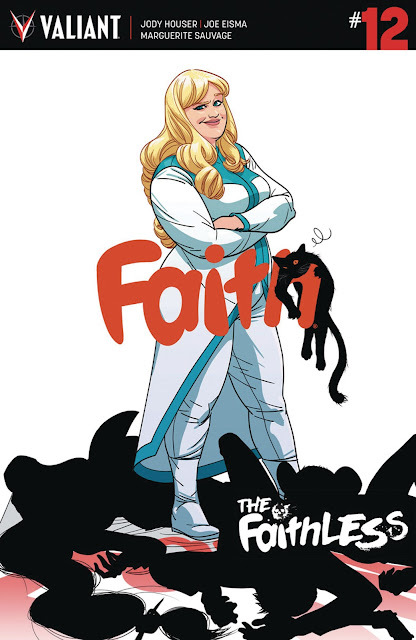 'Faith' as a series is an exceptional example of what makes comics fun and entertaining. This is why Faith deserved a better series finale than this. It's funny and Faith is as brilliant and likable as ever but the weak ending underserves this great title. Regardless, 'Faith' is a shot in the arm to the superhero genre that delivers unadulterated joy and optimism.